We first started funding War is Business (WIB) in 2010. We were initially taken with the site’s veracity and unique content that is at once accessible and participatory. These attributes, combined with Corey’s impressive investigative journalism track record, assured us that this start-up was something to pay attention to. WIB is a startup news site covering military contracting and the global arms trade. With content aggregated from anyone who wishes to submit, the site goes one step further than a Wiki as all submissions are reviewed thoroughly by the WIB team. The WIB interactive map is an impressive feature of the site. As an individual, it can be all too easy to separate oneself from the military-industrial complex that Corey describes below. What his site does, in part, is makes it all very personal. I can search for war contractor companies near where I live, see the faces of the people running these companies and be encouraged to do my own research and contribute. WIB takes something so enormous, so untouchable, and makes it personal. This is the spark of what this organization does that is so phenomenal. Below, Corey shares with us the genesis of WIB, its ins and outs, challenges and success, and how you can get involved. Here is an incredible opportunity to read some great writing from an impassioned and fiercely devoted reporter. War Is Business is a unique and somewhat experimental journalism project. It is small in size, with one editor (that’s me) and a handful of volunteer contributors and coders. But it is big in ambition, taking on two urgent threats to the prerequisites of democracy: a lack of information and a concentration of power. This project aims not only to enlighten people about the world around them by offering independent coverage of a complex, poorly understood and enormously influential sector of the economy, but also find and demonstrate a model for sustainable investigative journalism at a time when the traditional funding sources for that kind of journalism are fast disappearing. Say what you will about the mainstream media, but the current crisis facing newspapers and broadcast news organizations means that fewer skilled reporters are at work uncovering important information about government and the economy. Those reporters still employed at traditional media organizations are under pressure to produce more copy on increasingly trivial subjects. Many former reporters are going to work for P.R. firms—spinning one-sided stories instead of searching for the truth—or joining investment banks and hedge funds, thus ensuring that the only people with access to good information are those who can pay for it. The timing for this crisis in journalism couldn’t be worse. That’s because the most important information about the world we live in is getting harder and harder to find. Increasingly, the framing of public discussion and the course of global events are shaped less by public figures accountable to an electorate—that is, politicians—and more by private interests: wealthy and powerful individuals accountable to no one, or at least, to no voter. That last sector, the military-industrial sector, operates virtually free of scrutiny while enjoying virtually unlimited sums of public money, money that is more and more often channeled directly into private hands through outsourcing. Most former generals and admirals now go on to lucrative post-retirement careers working for the contractors they once oversaw. The privatization process, pitched as a way to increase efficiency, has actually created a perverse set of financial incentives to perpetuate armed conflict. This is why Eisenhower singled out the military-industrial complex. Nowhere else are the consequences of corruption so dramatic and so dire. 1.) Original reporting and commentary on military contracting and the arms trade. 2.) Aggregation of news on those subjects from hundreds of other sources. 3.) A public data bank, thousands of pages deep, that seeks to put names and faces on the people who profit from armed conflict—to make public figures of powerful private interests. Few independent news sites are doing these things, and no others are doing them all in combination. For the most part the defense sector gets covered by trade journals that exist thanks to advertising from… the defense sector! Hence they tend to avoid critical coverage. The website launched in September 2010. I’d gotten the idea for it some six months before, while working at the Santa Fe Reporter, although it had been gestating for many years without my being aware of it, feeding on observations collected over a number of reporting jobs in far-flung places around the world. New Mexico occasionally presented the opportunity to write about semi-secret military research projects and nuclear security boondoggles. The state remains in many ways a kind of military colony within the borders of the U.S., a harsh and inequitable place where chemists, physicists and weapons designers draw huge paychecks from defense contractors while their neighbors—descendants of native people and their Hispanic conquerors—struggle, having little hope for advancement and basically zero expectation of government beneficence. At that point I’d also done investigative reporting stints in Oregon, a state whose economy has suffered during this recession from an absence of large military bases, and in a half-Confederate, All-American base town in Georgia that happened to be the home of the second-largest National Security Agency presence outside of Fort Meade, Maryland. Prior to that, I worked at an English-language newspaper in Bangkok, Thailand, where I met elderly veterans of the CIA’s secret wars in Cambodia and Laos, and learned to my surprise that many large American arms deals with poorer nations are done an a so-called “offset trade” basis. That means the poorer country can pay for some expensive new gear like fighter jets with mundane commodities like rice, or chickens. Strange but true. So I had come across all of these stories over the years, and they all seemed pretty important and telling in their own way, and I was I suppose a little frustrated at how hard it was to convey that in the locally focused newspapers where I’d been working. The experience of launching War Is Business was something I imagine to be like giving birth one day, all of a sudden, without having known you were pregnant. And once the idea was there, I had to feed it. To save money on a limited launch budget I built the website myself, having only dabbled in small-time blogging prior to that and with programming skills many years out of date. For the better part of a year I worked overtime almost exclusively on getting War Is Business up and running and flush with information. Now, with some help from a skilled developer, I’m now in the process of preparing a redesign and re-launching of the website, which in its first year gained many readers but fewer donors. I’m also in the process of retooling some of the business and administrative aspects of the site, with an eye on making the entire project more financially stable and sustainable. This may include requiring a nominal subscription fee to access some features of the site that are especially costly and time-consuming to produce—especially the original reporting. I’d like to once again thank the Kindle Project for helping get War Is Business site off the ground. With big problems, people often wonder how they can help. In this case, the answer is simple. Read the site. Tell your friends about it. Spend 15 minutes exploring the maps on the site to learn about the defense contractors near your town. Invest another 15 minutes researching one of those companies online, and enter what you find—that makes you a contributor! It’s rare to get a full picture of an organization in its early stages. More often than not, urgency drives all moves at the beginning of a project and it can be a challenge to take the needed time to reflect and critically think about the work. For our last blog post we were fortunate enough to have the earnest reflections from High Mayhem’s Director, which allowed us to peer into the challenging underbelly of a successful art collective. 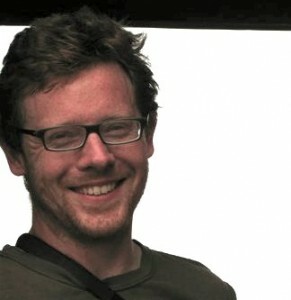 Now, having had the opportunity to learn more about Corey Pein and his impressive initiative, we’re all the more encouraged to ask these sensitive and behind the scenes questions to our grantees because we’re finding it gives us the most fascinating answers, and helps us understand the intricacy of the work we support. Please visit the WIB site, read, explore and contribute.